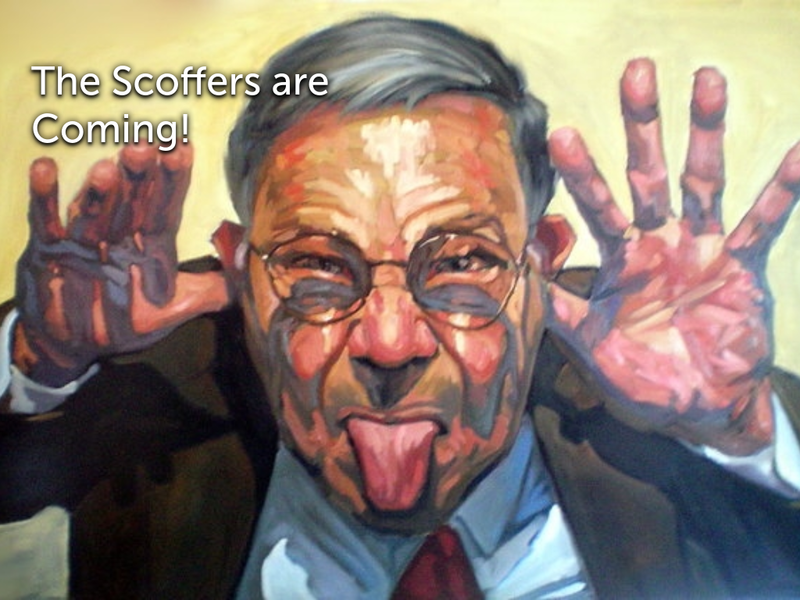 Sermon Notes for 2 Peter Part 8 – The Scoffers Are Coming! We are now in the 3rd portion of Peter’s 2nd letter. As noted before, he began in Ch. 1 by establishing the FOUNDATIONS of the Christian life, and how it can be lived out irrespective of our circumstances. Last time we saw Peter’s warning against FALSE TEACHERS which took up the whole of Ch. 2. And now Peter wants to help us keep our focus regarding the Promised FUTURE God Christ has won for all those who are found in Him by faith. And as we have seen over and over in Peter – remembering is a constant theme. It is a vitally important theme given the effects of the Fall on the human psyche. Dietrich Bonhoeffer in his little and insightful book “Creation and Fall” unpacks something of the practical importance of this fact. And nowhere is this more true than in our inability to balance off present trials and temptations, against the promise of Christ’s return and final judgment upon all sin. So Peter takes up his 1st point in these 10 verses. The term “Sincere mind” is a pregnant one. It holds the idea of decisions and opinions flowing from sound reason more than feelings. Temptation and the momentary forgetfulness of God that allows us to give into it gain their power in lives lived more by feelings and impulses than by reasonings and decisions that flow from Biblical truth in the moment. Now one cannot read the OT without encountering the theme of God’s judgment on sin. Both in the temporal, and in pointing to the FINAL JUDGMENT. And, one cannot read the OT without encountering the wonderful promises of the Day of The Lord and the restoration of all things. But Peter’s meaning here is more likely tied to the rise of false prophets and teachers he addressed in the previous chapter. I.e. You will have to keep reminding yourselves about the warnings about false prophets in the OT, and about the false teachers we looked at last time who Paul, and Jesus especially, warned about. False teachers will be a perennial problem in the Church and it requires real vigilance to keep safe. Remember, remember, remember – False teachers ARE coming! But beyond false teachers, Peter now mentions a 2nd category of dangerous folk. They aren’t as much interested in growing a group around themselves as the false teachers are – but more directed at simply undermining Biblical Christianity and especially the Believer’s hope in Jesus’ return, the resurrection, final judgment and the eternal state. How unsophisticated. How cartoonish. How fairy-tale like. And this, Peter notes is because they want to follow their own sinful desires. In denying the return of Christ and judgment, it would appear they want to follow their sinful desires without the pain of a guilty conscience now, or especially the thought of ultimately having to give an account for their sin later. And this is nothing new, is it? As D. A. Carson notes, the very first objection to God’s revelation in the Bible is found in Gen. 3 when Satan tells Eve that if she eats of the forbidden fruit there will be no judgment. “You will not surely die!” he scoffingly says. Christians cannot afford to be the equivalent of the present culture’s “snowflakes”, who melt at the hot breath of anyone who contradicts, voices a contrary opinion or scoffs. Jesus said He was returning soon – and how much time has passed? they ask. If there hasn’t been any final judgment up until now, what makes you think there will ever be one? Look carefully at Peter’s 3-fold response to this line of reasoning. They deliberately ignore the fact that God has judged before on a major scale – in the Flood. They deliberately ignore the fact that God waited a LONG time before sending the Flood / as He did with Sodom & Gomorrah; the Canaanites: Gen. 15:13-16; and Israel and Judah themselves. They deliberately ignore the prophetic warnings from the OT prophets, Jesus & the Apostles that a fiery judgment is to come. And by His Word of judgment will destroy it a final time by fire. Rejecting these realities lulls people into a false sense of security regarding their own sins. They do not admit a day of final reckoning. Now some may quibble over whether or not LITERAL fire is meant here like the literal water in the flood. And I don’t care whether you take it literally or metaphorically – the idea is the same: God is going to test everything and only what can withstand subjection to His holy presence will remain. Every impurity, everything temporary, everything that is not weighty and valuable weighed in the scales of God’s holiness and eternity with be utterly and completely purged away. The 1000 year reference here is not meant as a tool for calculations. Rather, it is simply to awaken us to the fact that the Lord is not bound by time the way we are. That as an eternal being, such constraints need to be set aside. And so, we need to let Him work His work in relation to His purposes and wisdom, and not according to the way we might conceive of “soon” and other such wording. Beware this does not send you down rabbitless holes. Romans 2:1–5 Therefore you have no excuse, O man, every one of you who judges. For in passing judgment on another you condemn yourself, because you, the judge, practice the very same things. 2 We know that the judgment of God rightly falls on those who practice such things. 3 Do you suppose, O man—you who judge those who practice such things and yet do them yourself—that you will escape the judgment of God? 4 Or do you presume on the riches of his kindness and forbearance and patience, not knowing that God’s kindness is meant to lead you to repentance? 5 But because of your hard and impenitent heart you are storing up wrath for yourself on the day of wrath when God’s righteous judgment will be revealed. And for you who do not yet know Christ – think of the patience of God in respect to your own life right now. You have been preserved thus far. You have been exposed to the Gospel once more – that Jesus died for your sins and calls you to Himself – to repent of your self-government against Him and His holiness, and to turn to Him in faith – trusting in His atoning sacrifice at Calvary. You are still alive to hear this – not because God is pleased with you as you are – but He is exercising Divine patience that you might repent and believe! Don’t squander this moment! You may well not receive another! The Believer will be spared, vindicated and rewarded. But even now, the Believer, having understood justice in light of the Cross, cries out for justice in the whole of God’s universe. Believer – Justice WILL come! Every foul deed will find its proper recompense.